Elmdon Lodge is located in the suburb of Acocks Green, which can be found mid-way between Birmingham city-centre to the north-west, Solihull to the south, and the NEC and airport to the south-east. There are great road, rail, and bus links to Birmingham city, Solihull, National Exhibition Centre and International Airport (car, taxi, and bus only - International is on a different rail line), as well as towns further afield such as Warwick, Royal Leamington Spa and Stratford-upon-Avon - making the area a convenient base for exploring the whole area. The local railway station is less than 5 minutes walk away. Using the train you can easily get to either Birmingham or Solihull, and journeys generally take less than 7 minutes. Acocks Green itself is served by numerous bus routes - including the Outer Circle (11a / 11c) which is one of the longest urban bus routes in any European city. How far is it to..? Acocks Green Railway Station For train travel throughout the area. Less than 5 minutes walk. 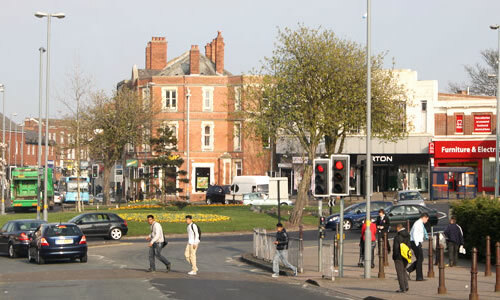 Acocks Green Village Centre For local shopping, supermarkets, amenities, and services. Approximately 8 minutes walking. 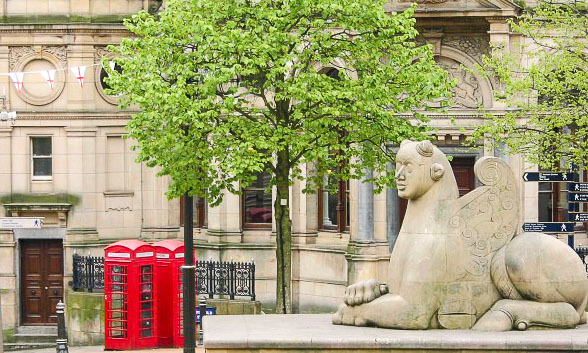 Birmingham City Centre For high street and designer shopping, nightlife, culture, and more! 6 - 8 minutes by train. Solihull Town Centre For high street shopping, restaurants, cinema, and leisure. 7 minutes by train. International Airport Onward air travel throughout Europe and worldwide. 10 minutes by taxi. National Exhibition Centre For concerts and showing at or visiting national exhibitions. Less than or around 15 minutes by taxi. * Distance and timings are approximate. Please use your preferred journey planner for detailed directions. Find us at: 20-24 Elmdon Road, Acocks Green, Birmingham, West Midlands, UK, B27 6LH. We are located on a quiet side street, called Elmdon Road, not far from the main A45 which runs from Birmingham city centre to the International Airport and National Exhibition Centre. Elmdon Lodge is situated midway down Elmdon Road on the left hand side and is just off the B4146 'Yardley Road'. You are now entering Birmingham! You should see us mid-way down the road on the left hand side. Flying into Birmingham International Airport? Taxis are available at both the airport and International Station / NEC. We are a 10-15 minute taxi ride from the airport. It's also possible to take a bus but you will need to change at (or walk from) the Swan Island in Yardley. When travelling form London it is easiest to depart from London Marylebone, as Acocks Green station is on that line. As not many of the London trains stop directly at Acocks Green station, you will probably have to change trains at Solihull station. You can stay on the same platform to wait for the local train, which usually leaves Solihull around 10 - 15 minutes after the London train disembarks. Our hotel is located just 5 minutes walk away from the station. Turn right as you leave the station, and continue on until you come to Elmdon Road. Turn right onto Elmdon Road, you will see us mid-way down the road on the left hand side. For London visitors travelling from Euston and for visitors from most other major cities, your Birmingham bound train will probably arrive into New Street. You will need to exit New Street and walk 5 minutes down the road to Moor Street station (the little station across the road from the Selfridges side of the Bullring Shopping Centre). From Moor Street, you can take an onward train to Acocks Green. Acocks Green is served by many bus routes, including the Outer Circle (11a/11c) which is one of the longest urban bus routes in any European city. The 37 service links Solihull to Birmingham City Centre and runs mainly along the Warwick Road, passing through Acocks Green at "The Green". The 31 service links Hall Green and Birmingham City Centre, running along the Stratford Road and passing through Acocks Green Village. The number 1 route runs between Acocks Green and Birmingham Town Hall via Moseley. The newly refurbished Birmingham coach station is situated on Mill Lane in a part of the city called Digbeth. Visitors with a lot of luggage may wish to take a taxi to Acocks Green. Taxis can be found at the Mill Lane taxi rank. Alternatively, you can take a local train to Acocks Green from Moor Street Station. Walk up Digbeth High Street towards the Bullring Shopping Centre - at the end of the road when you are facing the Bullring, bear right and right again to locate Moor Street Station. Elmdon Lodge is ideally located to discover the South Birmingham, Solihull and West Midlands areas. There is so much to do around here and there are always new things to discover. Here, we hope to give you some ideas about what to do during your stay and what you can expect from the local area! 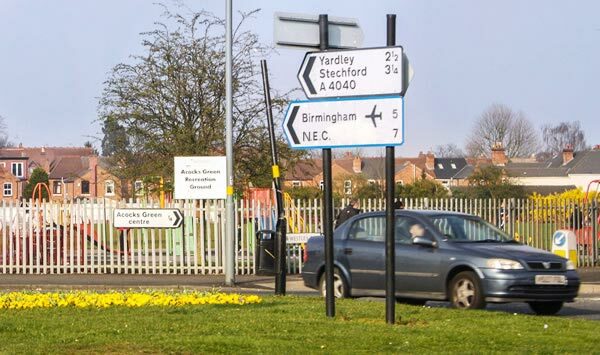 Acocks Green is a working multicultural suburb located to the South of Birmingham, roughly equidistant from the city-centre, Solihull and the NEC - making it a convenient base for exploring the area. In the 'Village' you will find a range of high street shops, chain-stores and independents - including Wilkinsons, several supermarkets, Dorothy Perkins, Works bookstore, Argos, and lots of pubs and restaurants (in a variety of cuisines & styles from Greek to Indian, and from Italian to Irish). Although Acocks Green is a relaxed kind of place you will find there is plenty to do! We have a world-class yoga centre, a leisure centre with swimming pool, LaserQuest and bowling alley, and several parks and green spaces which are ideal for jogging or relaxing with the kids. There's so much to do in Birmingham! We've got world-class shopping, arts, sports, entertainment (clubs, bars, concerts and gigs) and the possibility of exploring a Great British industrial and cultural heritage. Birmingham Museum and Art Galleries operates several fantastic cultural resources including the Birmingham Museum and Art Gallery itself where you can see an astounding public collection (and the world's biggest) of Pre-Raphaelite art including work by Burne-Jones and Dante Gabriel-Rosetti. From high street to ultra-designer - Birmingham's shopping has something to please. Visit the Bullring for mid to upper high street outlets (including Selfridges and Debenhams), the Mailbox for high-end shopping (Harvey Nichols and Armani), or browse through the streets to see what delights you can find! We have plenty of local shops and amenities right on our door-step! It's less than a 5 minute walk to an off licence & general store, grocers, fish & chippie / takeaway, English-style cafe, florist, post office, hairdresser, barbers-shop, newsagent, laundrette, the police station and the railway station (with quick links to the city-centre and Solihull). If you have extra time, travelling just a little way out of Birmingham itself there's even more to discover..! Shakespeares birthplace, the home of the RSC theatre company and a pretty town. A must-visit location to all first-time visitors the West Midlands. Warwick is a lovely little market town with a big castle in the middle! Great family fun attraction - jousting and mediaeval re-enactments on certain dates. With 10 award winning museums set in the River Severn Valley (still spanned by the world's first ever Iron Bridge - a World Heritage site) and 'passport' admission available for all museums, this museum complex is a great value day out where you can discover all about the Industrial Revolution and life in Victorian Britain with working demonstrations, fun activities and thought provoking exhibitions. Get up close with white tigers, monkeys and more!